This album is a collection of great songs from Motown Records. Music is a journey in many different ways! 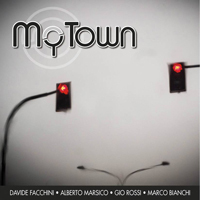 “My Town” represents another cool journey and also the opportunity to play with great musicians like Alberto Marsico, Gio Rossi and Marco Bianchi. I really enjoied playing some fun bluesy and jazzy stuff with a Telecaster!” The Telecaster, in my opinion, is the most versatile guitar, with a thousand tonal shades. I always love to play it. I really enjoyed creating and recording guitar parts for these arrangements.